A new award recognising the achievements of trainers in Young Farmers' Clubs in England and Wales is to be launched at the annual convention in Blackpool this weekend. The NFYFC Top Trainers Award will be officially announced at the annual general meeting being held at the Winter Gardens on Sunday 8 May and will apply to delivery of the new Curve suite of training modules that were launched in June and designed to support the effective running of YFCs. The eight, two-hour sessions cover subjects including networking, budgeting for events, safeguarding and marketing to new members and can be delivered during a normal club night session by qualified trainers. The new annual award takes into account both numbers of YFC members trained and quality of training delivery and evaluation. NFYFC training officer Joanne Bouchard said: "The Top Trainers award aims to promote best practice and enhance the quality and consistency of training throughout the federation. It also recognises and rewards the voluntary efforts of qualified trainers within Young Farmers' Clubs." 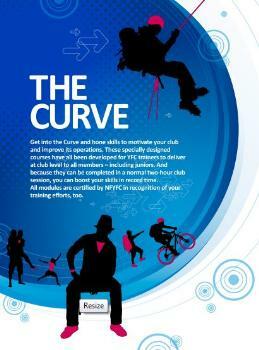 Click here to find out more about the Curve training library for your YFC or to download an NFYFC training directory. Yorkshire Air Ambulance will be the beneficiary of a 240-mile cycle trek to the annual convention in Blackpool by members of Howden YFC. The team from the East Riding of Yorkshire federation will be making their way to the event starting on the Trans-Pennine trail, which runs from Hornsea to Southport, and then onwards to Blackpool over the course of two days. Anyone wishing to help fill the coffers by sponsoring the team or making a donation can contact Andrew Farmery 07725 040240 or Sam Atkinson 07872 012901. Intrepid Young Farmers' Clubs members are gearing up to raise thousands of pounds for charities up and down the country as they make their way to the annual convention in Blackpool from 6-8 May. Around 4,000 members of the rural youth organisation are expected to attend the event at the Winter Gardens, which will host the finals of a number of hotly contested competitions, the annual general meeting, trophy and award presentation ceremony and the Agriculture & Rural Affairs Forum. Many of the clubs attending from England and Wales use the journey to the event to raise some of the estimated £1million a year generated for charities by the young volunteers. 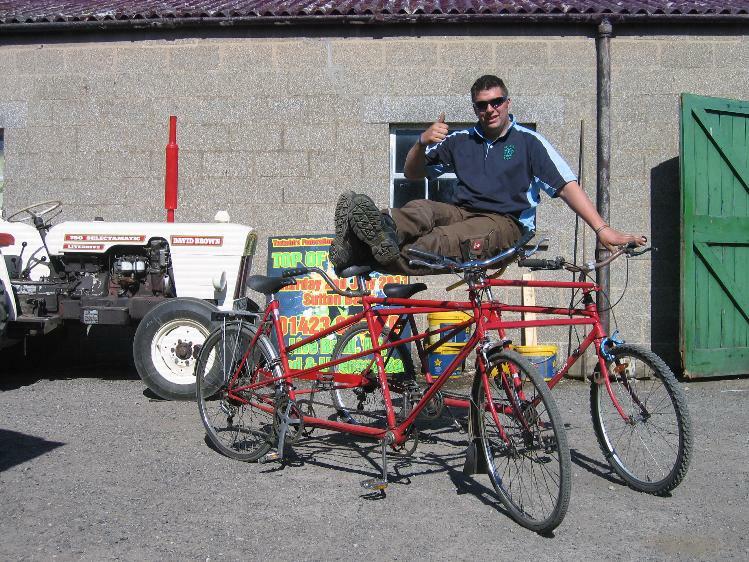 Yorkshire YFC is cycling coast to coast to the convention on a four man tandem towing a trailer of carrots as Yorkshire’s greatest export, and will pedal 148 miles from Scarborough to the Golden Mile raising funds for the Teenage Cancer Trust as they go. Previously Yorkshire members have travelled to convention by tractor, bath, three-wheeler cars, a giant pedal powered crisp box; and last year they arrived at Torquay on a homemade recycled six-man amphibious craft via inland waterways and the sea. Not content with a normal Three Peaks Challenge, Cornwall YFC will add a fourth peak to their fundraising trip. Members will begin their journey by walking up Brown Willy (420m, the highest point in Cornwall) and then proceed to climb Snowdon (1,085m), Scafell Pike (978m) and Ben Nevis (1,344m) before arriving in Blackpool on Friday 6 May. Funds raised will go to Precious Lives Appeal and Cornwall Air Ambulance. Ten YFC members from Harper Adams Agricultural College will be cycling 100 miles in two days to raise cash for a host of charities. 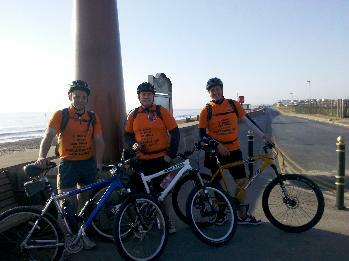 The ride will take the group from the University College in Shropshire, to Blackpool via Chorley. They are raising money for the Anthony Nolan, Macmillan, Leukaemia and Lymphoma Research, and Teenage Cancer Trust charities, and are currently trying to fit their cycle training around lambing work! Lancashire YFC is cycling from Bridlington to Blackpool, 150 miles in two days and will be raising money for Lancashire County Federation this time round. Lowdham YFC members are cycling 125 miles from Halam to the NYFC AGM Blackpool in aid of MNDA (Motor Neurone Disease Association). James Bust, Jack Tooley and Chris Frost are cycling with Becca Welton helping out as a support vehicle. The journey will start on Thursday 5 May and the club will travel over the Pennines, through Wigan and Preston to hopefully to arrive in Blackpool by Friday lunchtime. The group will be wearing hi-vis YFC tops, so cheer them on to show your support if you see them. NFYFC events steering group chairwoman Hollie Harris said: The National Federation of Young Farmers’ Clubs is delighted to be returning to Blackpool for this event which is the highlight of the YFC calendar. “We have enjoyed working with the venue, businesses and authorities in Blackpool, which always makes us very welcome and works hard to ensure the event is a success. And we are really looking forward to seeing the results of the regeneration and refurbishment work in the town and at the venue that had just begun during our last visit in 2009. “Fantastic entertainment has been lined up during the three days, and more will be on offer from the YFCs competing in the jazz dance and entertainments competitions, which features cabaret-style performances this year, and which is already a sell-out. “A prestigious panel of speakers will be leading the discussion and debate at the Agriculture & Rural Affairs Forum, which this year focuses on promoting British agriculture. Follow this link to see which teams are through to the NFYFC competition finals and the federations taking home the silver at the trophy presentations this year.